Great was the rejoicing in the south tower of Myron Taylor Hall, headquarters of the LII, when we got notice of the bulk release of the Electronic Code of Federal Regulations (eCFR) in XML format. What was not to like? The data was as up-to-date as the CFR could get, the XML was much cleaner than the book version, it had a friendly user guide etc., etc., etc.. It was also different enough from the book XML of the CFR, that we could not simply run it through our existing data enrichment process and serve it to the public as is. So, we curbed our enthusiasm long enough to put together a measured plan to re-do our code. We have heard enough from you, our wonderful readers, that text indentation was one of the most valued features of our data presentation. Thus, it was the first feature we chose to implement. All this verbosity is the set-up for a look at some of the messy sausage making details of adding indentation to the eCFR. <HED>Authority:</HED><PSPACE>44 U.S.C. 1506; sec. 6, E.O. 10530, 19 FR 2709; 3 CFR, 1954-1958 Comp., p.189. The text of the regulations are enclosed within tags that provide some context for what you’re looking at, have meaning for how it should be displayed or provide additional metadata that may be useful to the enrichment process. As a first step, we consulted the user guide to see if there was any information on how to indent the text. There was something! On page 13, was this snippet of XML (Figure 1) with the enumeration indicators highlighted. The next page had a suggestion for how that could be displayed (Figure 2). Obvious to us and as indicated by the user guide itself, there was no way to achieve this display given just the information from the markup. A good place to look for extra information was within the CFR itself. level 1(a), (b), (c), etc. level 2(1), (2), (3), etc. level 3(i), (ii), (iii), etc. level 4(A), (B), (C), etc. level 5(1), (2), (3), etc. level 6(i), (ii), (iii), etc. In our first iteration of indentation, we added attributes to each paragraph defining a depth of indentation corresponding to the 6 levels above. 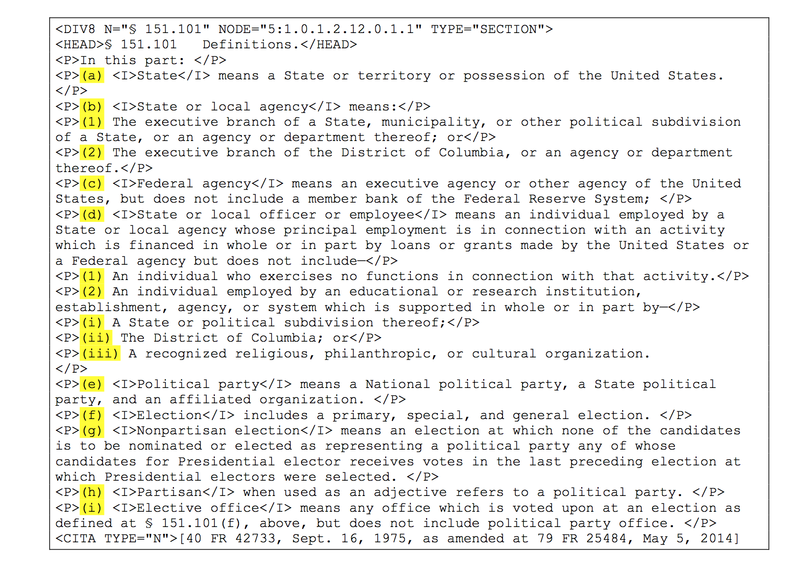 Section 151.101 of Title 5, the example in the user guide pages above, looked lovely. But, (you knew it would not be that simple, right?) this implementation worked fine for only about 60% of the random selection of sections we tested it on. Where the algorithm did not work, the main reason for failure was the presence of multiple enumerators within a single paragraph. In other words, each enumerator should have its own paragraph but not all paragraphs were marked as such. In the snippet above, we have the case where there are 2 enumerators at the beginning of the paragraph. Since our algorithm assumed one enumerator per paragraph, it would only find (a) but not (1). We fixed that in the second iteration. In our third iteration, we went after more embedded enumerators (see snippet 3 below) by creating a category for these previously untagged enumerators. We named them, nested paragraphs, and tagged them as such. In the last snippet, the paragraph has 3 enumerators, (a), (1), and (i). We’ve developed a library of patterns that our algorithm uses to find them all. In title 26 alone, we find and tag 13,563 nested paragraphs! So, we now have a pretty nice indentation feature, that while not completely finished, is already an improvement over what we were able to do before for the CFR. See 8 CFR 103.3 (a)(1)(iii)(A) and its corresponding eCFR version for an example of this. We’re putting it on the back burner for now but there is more to come for indentation. For instance, we know from extensive study of the markup that there are actually 8 levels of nesting to be had, not 6. 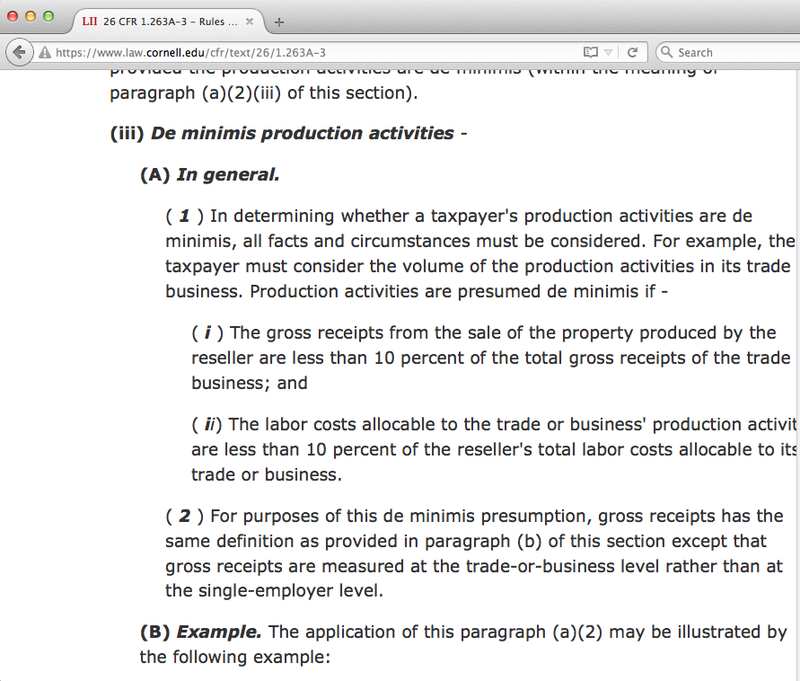 And, we have to provide special handling for sections that do not follow the numbering scheme in 1 CFR 21.11. We’re grateful for our beta testers and readers. If you come across places where our current indentation scheme does not work, please let us know. In the interim, we’ll be devoting some brain cycles to adding cross references and other links to the eCFR. 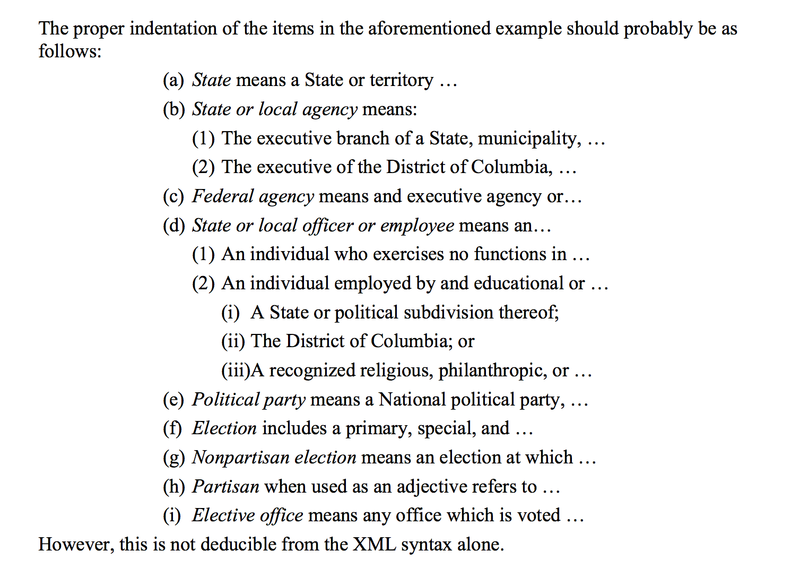 Note how the enumerators 1, i, ii, 2, and their enclosing braces are not properly bolded. Not good! Since I am the sort that deems suspicious, anyone who posts a Craigslist advertisement with grammatical errors, I can see why someone would take issue with a publisher improperly rendering the bolding on a piece of text. So, it’s fixed. Now, since I am also basking in the euphoria induced by fixing this presentation problem, I will not bore anyone with the details of negative look-ahead, greedy, non-greedy, capturing, and non-capturing pattern matching with regular expressions in python, while carrying my laptop, uphill, both ways to and from my office, …. … there’s another kind of detail that no shop manual goes into but that is common to all machines and can be given here. This is the detail of the Quality relationship, the gumption relationship, between the machine and the mechanic, which is just as intricate as the machine itself. Throughout the process of fixing the machine things always come up, low quality things, from a dusted knuckle to an accidentally ruined “irreplaceable” assembly. These drain off gumption, destroy enthusiasm and leave you so discouraged you want to forget the whole business. I call these things ‘gumption traps’. – Robert Pirsig, Zen and the Art of Motorcycle Maintenance. We’re in a gumption trap, and it’s slowing down our eCFR feature rollout. We’ve met some unexpected challenges (unexpected, except insofar as you expect, in a general way, that all projects have challenges). In a group as small as ours, passing around a cold can be enough to stall a project for a week – or two. Right now, though, one of the three team members who has been working on the eCFR is leaving for a new job, and this will naturally slow things down for the next few months. We’re still working on stuff: improving our indents, for instance. But some of the new features which we have beautifully, intricately constructed in our heads — our ideas of Quality — are going to take a while longer to get out into the real world. We’re down a mechanic. All projects have difficulties complications, setbacks, gumption traps. They’re not covered in the shop manual. We spend our days skinning our knuckles on coding details, saying “wait, this regex needed to be capturing and that one needed to be non-capturing!”. It’s nice, at the end, when you’re seeing the beautifully humming final product, to forget them. But they’re an essential part of the process. In other words, “Motorcycle maintenance gets frustrating. Angering. Infuriating. That’s what makes it interesting.” Something to bear in mind when you start turning the first bolt. eCFR 0.1.3 - Who authorized this?! The Code of Federal Regulations (CFR) compiles regulations promulgated by various regulatory agencies — part of the executive branch. But that regulatory power is grounded in legislative power. At some point, some Congress — drunk or sober —passed a law enabling the agency to make such a rule. So, as one of the basic features of the CFR we provide hyperlinks from each regulation to the point in the U.S. Code which provides the basis for its rule-making authority. This week we restored those links to the eCFR text. Here’s an example. According to federal regulations, schools can’t share your grades with your parents once you’re a grown-up, which is how you managed to keep that D+ in History 101 from Daddy (thank goodness!). But who said they could do that? If you look at the hyperlinks for “authority”, you’ll get to the Family Educational Rights and Privacy Act of 1974 (with various later amendments). So before 1974, that D+ was fair game, which was why Grandaddy grounded Daddy for a month that one time. Of course there are a bunch of nitpicky details to take care of in order to mark up the authorities correctly. More on that soon. Sometimes the littlest features have the biggest impact. Some small tweak can vastly enhance the user experience. Why do we indent the eCFR? Hey, the government doesn’t indent their version? It’s like in school when they taught you to outline. The ECFR has a hierarchical structure. We indent… so you can read. Well, those seeking up-to-the-minute regulations (well, up-to-the-last-few-days, anyway) are in luck. The Office of the Federal Register and the GPO have made available, in bulk, a machine-readable (XML) text of the eCFR, the Electronic Code of Federal Regulations. The eCFR is unofficial, but it is very much up to date. So, in order to satisfy those of you who have been eager to get the latest in great tasting, less-filling, fresh-from-the-oven regulations, we are going to be rolling out our new edition of the CFR, based on the up-to-date eCFR XML, as we go. We have put the bare-bones text up as quickly as possible. Many of you have told us how much you like the value we add to our editions — rest assured that we will be adding in all the features you value just as soon as we can adapt them to the new data format. While we’re renovating, “CFR Classic” will continue to be available. Stay tuned on this blog for details about the process of designing, developing, and implementing those features, as well as announcements when they are up and running. And let us know what you’d like to see added – we always love to hear from you!